Our number one rule (and Ellie knows it well!) is that she has to be wearing her floatie before we open the gate. She's not allowed to take it off until we have left the pool area, either. Speaking of floaties, we have THIS one and it has made going to the pool ten times easier. It's coast guard approved (!!) and it helps those pre-swimmers gain confidence in the water. Addie isn't quite old enough for a floatie yet (I need to get her a life jacket! ), so she stays attached to my hip 100% of the time. The minute she gets set down, she makes a beeline for the side of the pool, ahh! Having Ellie in a floatie makes holding her much easier. I've also used THIS wrap in the pool. It's super cute and allows me to have two hands available. We always spend a few extra minutes packing up our bag for the pool. We try to sunscreen at home before leaving and typically, I try to leave my phone at home while we swim. I don't want any distractions that keep me from watching my kids near water. 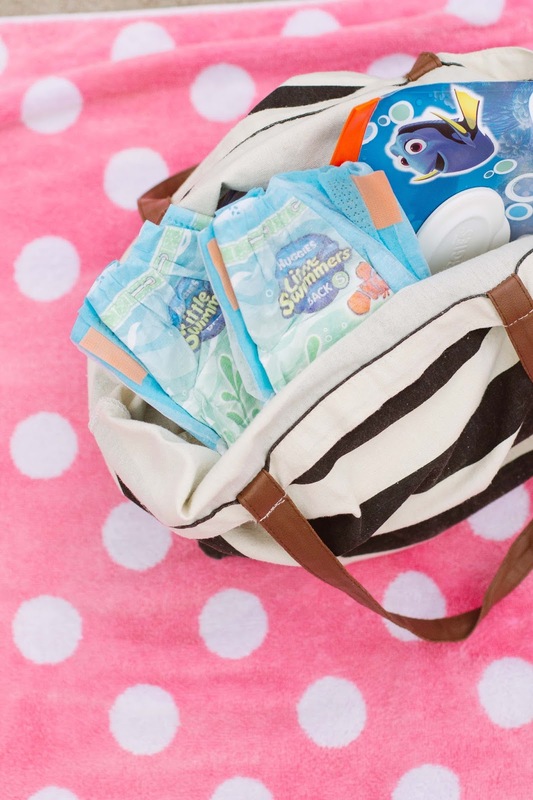 In our bag, we always pack a few toys, snacks, water bottles, and extra sunscreen. Oh, and diapers and wipes, of course! (I've learned the hard way, dragging everyone back home for a quick diaper change and dripping water everywhere!) 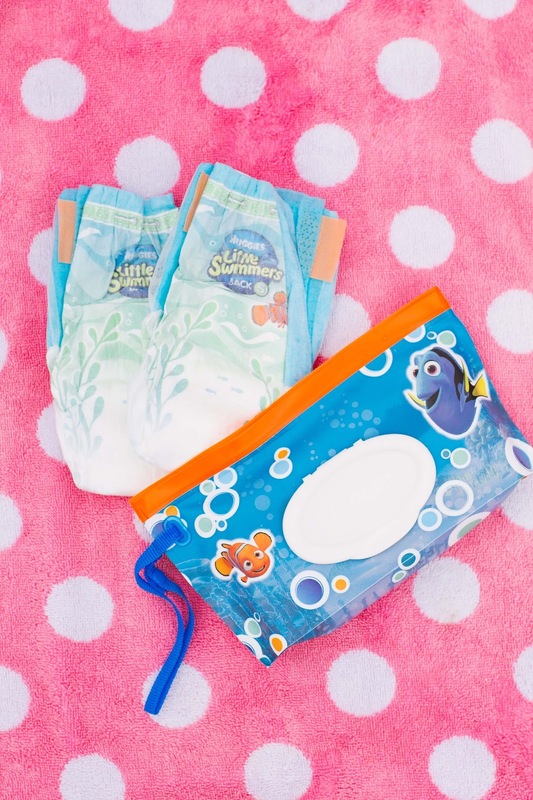 We love using Huggies Little Swimmers while we swim (featuring Finding Dory characters!) 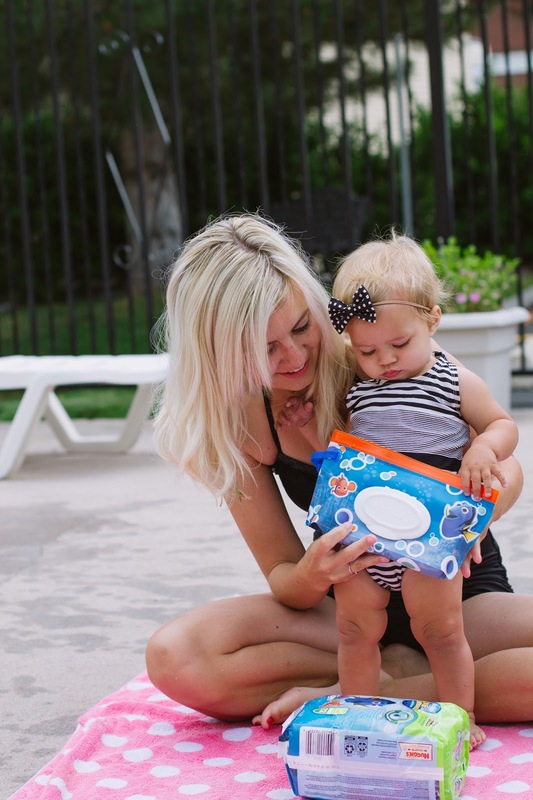 These swimpants have easy open sides to make pool side changes a breeze - seriously so helpful! Having some Huggies Natural Care Wipes on hand are essential - not only for quick changes, but also for messy hands after snack time! 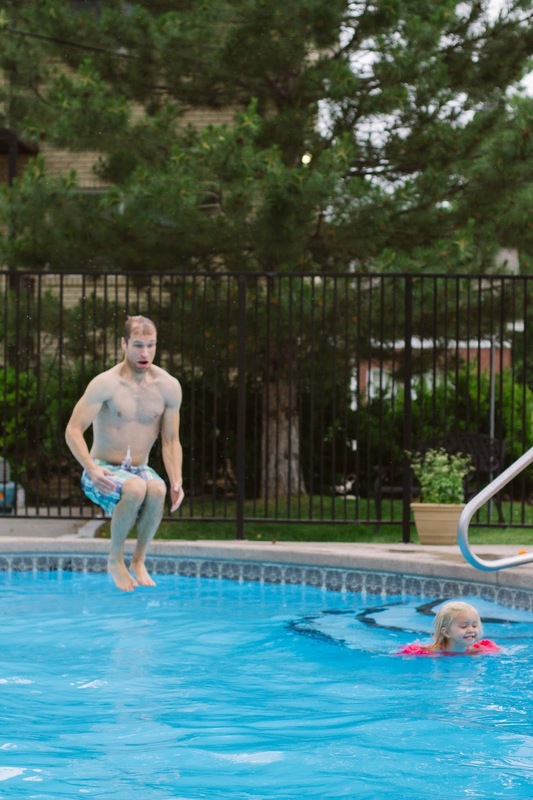 The old swim teacher in me comes out every time we're in the pool. I try to throw in a few of my old tricks - playing Motor Boat to practice blowing bubbles and putting face in the water, Chop Chop Timber to help with jumping in the pool, practicing big "ice cream scoops" to encourage moving arms in swimming motion, and putting head back in the water with tummy up and arms out to practice floating (while we pretend we're mermaids, of course). Even with Addie, we work on kicking legs and floating (while holding her the whole time, of course.) The girls think it's hilarious and so much fun. Whenever possible, we make sure there's another adult there. Though it's not always an option while Brian's at work, it does make it SO much easier to have another pair of eyes! We've been lucky to meet a few friends here who absolutely adore the girls, and the girls love swimming with them! For worry-free water fun in the sun, look for Huggies Little Swimmers with new Finding Dory characters at a retailer near you, and follow this link to download a coupon for $1.50 off your first pack of Huggies Little Swimmers – for a limited time – and find other Huggies offers. 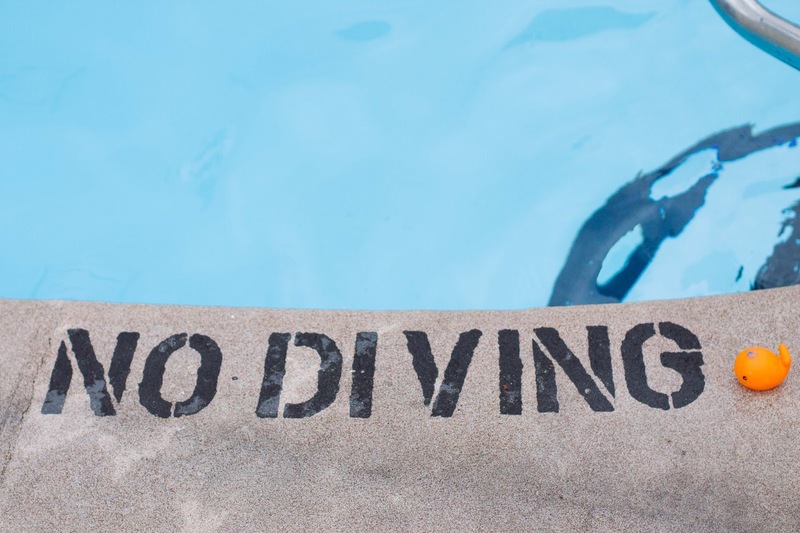 It IS hard to do two littles by yourself around water - fun, but definitely not relaxing ;) thanks for the swimming lesson ideas, brilliant! 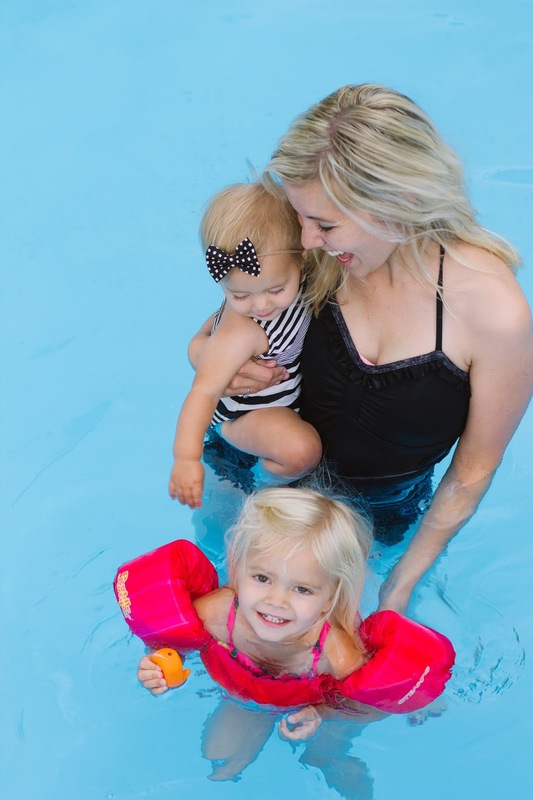 Ive been carrying my youngest toddler in the ergo when we walk around the lazy river at the watermark so I can push the older toddler in her tube, but it's probably not good for the ergo to be exposed to chlorine everyday so I might have to try that steikke wrap!